It has been over 50 years since North Lawndale has had a comprehensive plan that could be used to attract resources and guide public policy as it relates to transportation, utilities, land use, recreation, and housing. As a result, much of the limited development that has occurred in recent years has not been coordinated or yielded maximum impact for the community as a whole. There are some pockets of North Lawndale that have seen significant development, while other parts have remained untouched since the 1950’s. 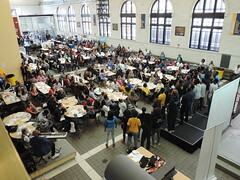 To further build upon comprehensive planning efforts, on June 3, 2017, North Lawndale Community Coordinating Council (NLCCC) in partnership with Local Initiatives Support Corporation (LISC) and Chicago Metropolitan Agency for Planning (CMAP) held the second annual conference at DRW College Prep High School. 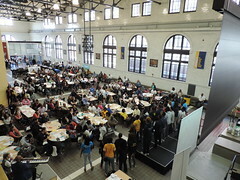 Kevin Sutton, Executive Director for the Foundation for Homan Square served as the community conference chair, event planner and master of ceremonies. Kevin Sutton (above) setting tone with agenda for the day. Sutton (below) receives award from executive team, (from left to right) Dr. Dennis Deer, Sheila McNary and Rodney Brown for tireless commitment to successful planning and implementation of the conference both years. There were over 200 North Lawndale stakeholders, including children, young adults, residents, clergy, leaders of organizations, donors, business owners and volunteers in attendance. DRW Principal, Matt Kelly, graciously welcomed everyone to the conference. DRW Honors Choir followed Mr. Kelly with a melodious spiritual chorus directed by Martin Woods. DRW College Prep High School Honors Choir open conference with spiritual melody. Rodney Brown, Dennis Deer and Sheila McNary, members of the NLCCC Executive Sub-Committee, provided an overview of NLCCC, its approaches to comprehensive planning, the structure of the organization and what the organization has accomplished to date. One of the accomplishments highlighted, is the establishment of North Lawndale’s first Arts Festival. The Arts Festival afforded residents, local artists, business owners and others an opportunity to display their creative gifts and talents. NLCCC Executive Team (from left to right), Rodney Brown, Sheila McNary & Dennis Deer. Paul Coffey, 7000 Oaks Project, presented on the proposed plan for planting 7000 oak trees in the community. He shared the four pillars of 7000 Oaks, which includes the environment, health, job creation and equity. Paul Coffey, community engagement leader and environmentalist. Also, Early Action Grant Winners are announced for their successful application of building upon quality life initiatives with immediate projects that improve the community educational, social & cultural, professional and recreational climate. The winners includeArts & Culture (NLCCC) – Arts Festival, Camp Mind Over Matter (M.O.M.) – Recreational Clinics, Celestial Ministries – Community Ministries, Chicago Youth Centers Epstein- Columbia Project, Chicago Urban Art Retreat Center – Youth Art Programming and Fest, Dvorak School of Excellence – Plant Pollination Beautification, Gardeneers – Food Production Garden, Gold One – Chicago Historic Route 66, Invizion – Creative Art & Wellness Program, Men Making A Difference (MMAD) – Summer Cultural Training Program, Mini Medical Program of North Lawndale – Summer Curriculum, MLK Fair Housing – Social Justice & History Curriculum, Public Safety (NLCCC) – Dance Lawndale Program, St. Agatha – Writer’s Boot Camp, and YMEN – Family Garden and Park. Tameeka Christian encourages all stakeholders to own the planning process through active contribution of their ideas in the breakout workshop discussions. The DRW Dance Team is invited to celebrate in dance as the workshop attendees prepare to shift from the invitational and informational portion of the day into planning mode. The attendees choose different breakout sessions to participate in the workshop discussions centered on actions to address the issues that stakeholders identified in the community. There were seven collective discussions as follows: 1) Economic & Workforce Development led by Rodney Brown and Brenda Palms Barber 2) Education & Youth/Sports & Recreation facilitated by Dr. Betty Allen Green and Claude Robinson 3) Greening & Open Space/Arts & Culture Housing, facilitated by Sheila McNary and Nancy Zook 4) Housing facilitated by Richard Townsell; 5) Health and Wellness, facilitated by Debra Wesley; 6) Transportation, Infrastructure & Technology, facilitated by Dr. Dennis Deer and Barry Pollard; 7) Public Safety, facilitated by Norman Livingston Kerr. Brandon Nolin, a Senior Planner with CMAP, provided instructions on how to complete the mapping activity designed to help encourage stakeholder’s development ideas and strategies for different locations throughout the community. Brandon Nolin, CMAP representative provides mapping exercise expectations. Over the next few months or so, the data will be compiled and shared via a written plan. Here’s a link to the mapping exercise CMAP Mapping Documents. A webpage with an overview of CMAP’s work with North Lawndale, and a copy of the Power Point presentation for the day are found at June 3, 2017 Conference Presentation. The notes from the conference will be used to build upon the comprehensive planning process and to identify goals, objectives and desired results of the planning process. The notes are being compiled and will be posted on the NLCCC website within the next few weeks. Visit http://nlcccplanning.org to learn more about the organization. Keep up with the latest events by finding the organization on Facebook.